ESIC Junior Engineer Answer Key Check Here. ESIC Junior Engineer 2019 Mock Test Check Here. ESIC Junior Engineer Govt Job 2019 Admit Card Check Here. ESIC Notification is out. 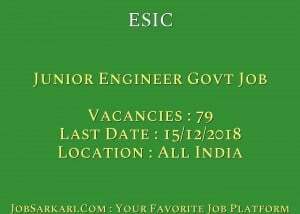 ESIC is recruiting for 79 Junior Engineer Govt Job 2019 Posts. You can check ESIC - Employees State Insurance Corporation last date, download ESIC notification, visit ESIC official website and check other ESIC Vacancy details.Complete Vacancy and recruitment Details about 79 Junior Engineer Govt Job 2019 vacancies in ESIC are provided below by JobSarkari.Com only for you. Last Date for Apply Online 15/12/2018. Last Date for Payment of Fee 18/12/2018. SC / ST / PH / Female Rs.250/-. Junior Engineer (Civil) 26 15 06 05 52. Junior Engineer (Electrical) 13 08 04 02 27. Total No of Post 39 23 10 07 79. Candidate Must Have Passed Degree / Diploma in Civil / Electrical Engineering With 02 Years Professional Experience in Related Field. Not Exceeding 30 Years as on 16/12/2018. 6.Online Application Can be Submitted on or Before 15th December 2018. Q. What is the Last Date For ESIC Junior Engineer Govt Job 2019 Vacancy ? A. 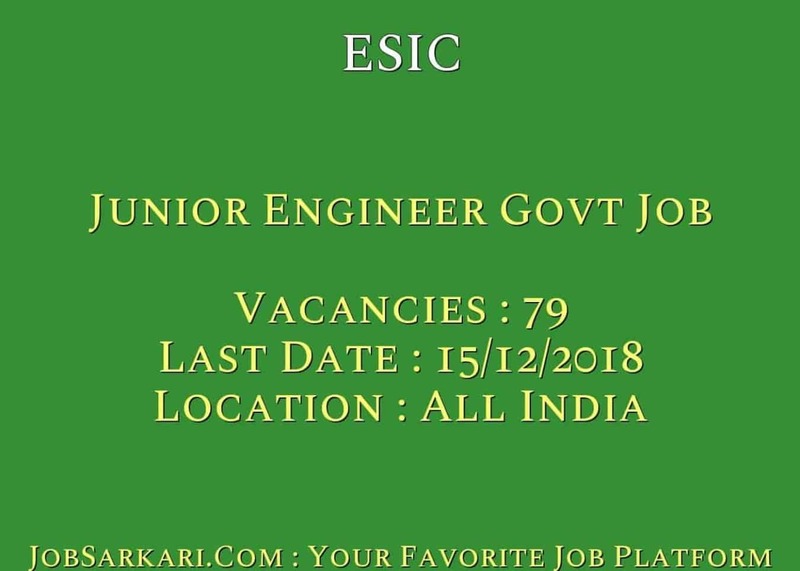 Last Date for ESIC Junior Engineer Govt Job 2019 Posts is 15/12/2018. Q. What is the Form Type of ESIC Junior Engineer Govt Job 2019 Recruitment ? A. The Form Type for ESIC Junior Engineer Govt Job 2019 Posts is Online. Q. How many vacancies are available in Employees State Insurance Corporation Junior Engineer Govt Job 2019 Posts ? A. There are about 79 Vacancies in Employees State Insurance Corporation Junior Engineer Govt Job 2019 Posts. Q. What is the Full Form of ESIC ? A. Full Form of ESIC is Employees State Insurance Corporation .